The United States will continue to exert pressure on Russia. There will be no business contacts with Russia until aggression in eastern Ukraine is ongoing. "President Obama has made it clear that we will continue to exert pressure as long as Russia continues aggression and annexation of the foreign territories. It is not our choice. There will be no business as usual between our countries until the aggression against Ukraine is stopped," the Ambassador said. 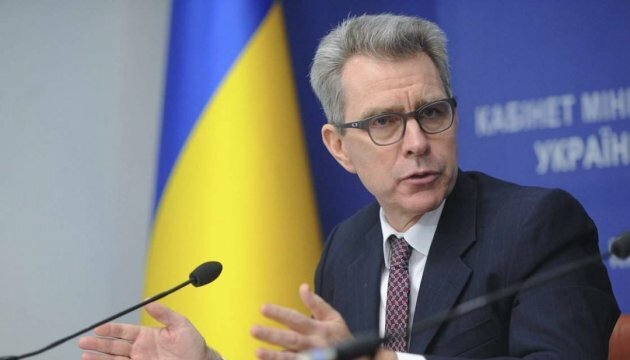 Pyatt believes that now all the efforts should be aimed at the implementation of the Minsk agreements. "We must focus on de-escalation of the conflict and insist on implementation of the Minsk agreements. The first provision of the Minsk agreements is a complete ceasefire. The central intelligence department of Ukraine has released today a large document, which says that Russians supply military equipment to the Ukrainian territory. This contradicts the Minsk agreements," Pyatt said.